Firetech recently discovered through the Joondalup Learning Community a fantastic organisation nurturing kids’ self-learning journeys, independence and success. The Children’s University Edith Cowan Program (CU ECU) provides extra-curricular learning opportunities for children aged between 7-14 years (and 5-6 year old’s with their families) and volunteer opportunities for 15-18 year old’s; “the aim is to engage children and young people in learning in its broadest sense and to provide the scaffolding for them to develop self-efficacy, confidence and aspirations”. Children’s University Australia fosters wellbeing by promoting ‘free range learning’, encouraging children to try out new activities, discover new passions, visit new places and above all have fun. Kids collect hours on their learning passport which are signed off by independent, quality assured learning destinations. Credits are accumulated, and when they reach the hours needed to graduate from CU ECU, children are awarded with certificates at a formal graduation ceremony which will be held at ECU Joondalup Campus. Graduation levels range from Bronze Award level for 30 hours of learning to Doctorate for 1000 hours of learning. Students aged 15-18 years are issued with a passport to Volunteering to encourage them to participate in CU ECU by volunteering to run clubs, assist with graduations and events, become role models to younger students etc. In Perth WA, Edith Cowan University is CUA’s partnered university and Firetech is excited to continue growing our relationship with the School of Engineering in this new dimension. Firetech’s school holiday workshops, after-school clubs and co-curricular school activities are all available to build credit towards kid’s graduation celebrations. 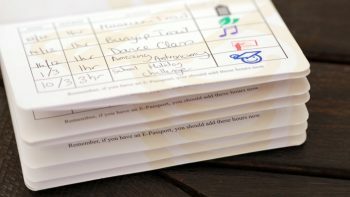 A Children’s’ University Learning Passport in Action. For us at the Firetech Team, Children’s University Australia provides a strong stepping stone in the journey from the “now” or the position of the child at School, to their future – as part of our next-generation workforce. For our growing engineering and ICT industries, tertiary education is a strong goal for any wanting to further their academic skill set and succeed in an evolving digital world. “For kids in the future world of Tech it’s about not just consuming and using everyday technology, but producing and innovating, and being inspired to build and feed that curiousity.” says Firetech’s Leader. To the kids and team who are all a part of Children’s University Australia – Keep up the great work! We’re here to support you on your journey. For more information on how to get your school involved with CUA’s ECU program contact the CUA team.